Between the stylish exterior, contemporary features and top-notch capability, the 2016 Hyundai Elantra is an undeniable choice for buyers seeking generous amenities and extra comfort wrapped in an unbeatable value. Rolling out in 2016 with a new trim level, this mid-size sedan carries on the Hyundai legacy of refinement and practicality. Plus, with long warranty coverage, premium safety features and security options, the 2016 Hyundai Elantra in Dallas proves to be a worry-free choice built for your satisfaction. A perfect fit for buyers looking for extra features at an affordable price, the all-new Value Edition trim bridges the gap between the base SE and the upscale Sport and Limited models. While the standard SE comes with the practical features like a 60/40 split-folding rear seat, a premium audio system with Sirius XM and MP3 capability, a trip computer, vehicle stability management and remote keyless entry, the Value adds extra indulgence with heated side mirrors, Bluetooth hands-free software, a 4.3-inch color touchscreen display with a rearview camera and solar glass that prevents extra glare on sunny Texas days. At the top of the lineup, the Limited trim delivers a luxury-car experience at a price that won't break the bank. Sharing a 1.8L I-4 engine rated at 145 horsepower, the front-wheel drive SE, Value and Limited models offer a combined fuel economy that hovers around 32 mpg. Drivers seeking extra agility will be pleased with the Sport trim, a favorite in the eyes of our 2016 Hyundai Elantra review. Utilizing a 2.0L 4-cylinder engine, the Elantra Sport delivers 173 horsepower and 154 lb.-ft. of torque that will leave competitors in the dust. Beyond the comfort and performance, the 2016 Hyundai Elantra in Dallas flaunts a Fluidic Sculpture style that will turn heads as you smoothly turn corners. The wraparound projector headlights, front fog lights and lower wheelbase add to the agile profile that is as alluring as it is aerodynamic. A safe, convenient and impeccable choice that is bound to make your friends green with envy, this mid-size sedan equips drivers with infinite opportunities. Sporty for your active lifestyle, yet practical when it comes to efficiency and safety, the Elantra is undeniably charming. Want to learn even more? Check out the rest of our 2016 Hyundai Elantra review below or visit our Dallas-area dealership to experience the quality for yourself. 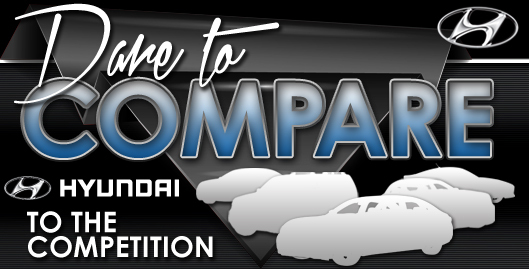 Compare the 2016 Hyundai Elantra to vehicles like the 2016 Toyota Corolla, Ford Focus, Mazda3, Honda Civic, Nissan Sentra and the Chevrolet Cruze, and we're sure you'll see that the Elantra outperforms the competition in a variety areas. 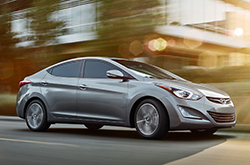 Just a few of the attributes that shoppers in TX will be pleased with are the Elantra's attractive looks and affordable price. It's a spectacular value. Just compare its price to the aforestated list of vehicles and you'll surely see why so many Carrollton drivers love it. The bullet list below this paragraph will give you even more info about its specs! 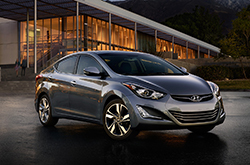 Now that you've read the 2016 Hyundai Elantra review above, please contact Van Hyundai for a test drive. We take our obligation to provide the best reviews recorded by automotive experts - it's just one more thing that makes us a chief Hyundai franchise in Carrollton. 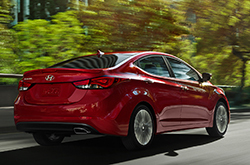 Want to know about the 2016 Elantra's fuel economy and other specs? As your Hyundai franchise, you can count on us for accurate information. Now that you've learned all about the 2016 Elantra, we'd love to have a conversation about how we can help you; fill out the form on the right to message us today to learn about current lease offers and make an appointment for a test drive!